This delicious dip is certain to disappear in a hurry. Instead of using store-bought guacamole, you make your own by mashing the avocados. The perfect party dip, which your guests won't soon forget. Peel, pit and mash avocados in medium bowl. Add the lemon juice, salt and pepper. In a separate bowl, combine the sour cream, mayonnaise, and taco seasoning. May be made in advance and refrigerated. If you do make this in advance, set it out about a half hour before serving so that some of the chill is taken off. 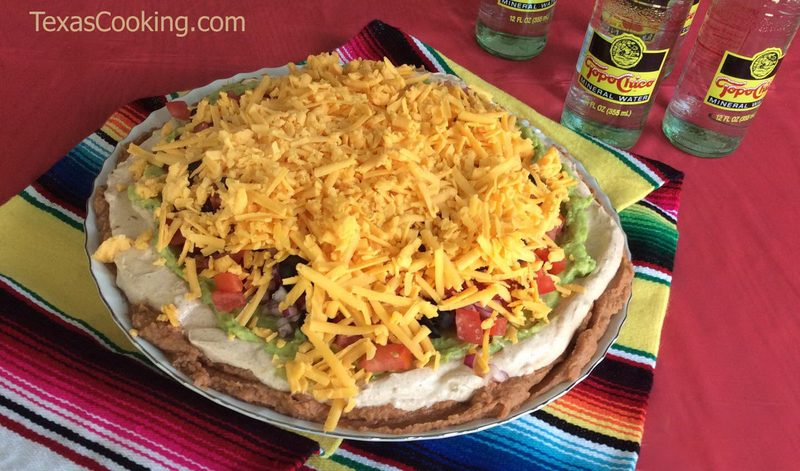 This Seven Layer Dip assembles perfectly in a colorful Fiesta 9 inch by 13 inch baking dish. Readers may also enjoy John Raven's article on chips and dips and our own recipe for guacamole.